In the early part of February 2015, Assistance Inspector General of Police, IGP, Mbu Joseph Mbu was reported to have locked no fewer than 50 policemen in Police cells in Lagos State, where he was newly posted to serve. According to media reports, “The AIG while fielding questions from Journalists after a closed-door lecture with senior police officers at the Ogun State Command, Eleweran, Abeokuta, the Ogun State capital, said about 70% of officers lack discipline. 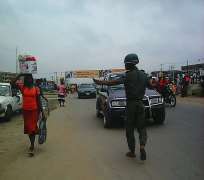 At Osisioma Junction in Aba, Abia State, this reporter spotted a policeman who deserved Mbu's Police cell for dressing indecently. The reporter snapped a photo of him. He was wearing sandals and was flagging vehicles down supposed to be for a mutual search. His appearance reminded this reporter the statement by Mbu thus: “What I have noticed is that there is much indiscipline amongst the policemen, they dress anyhow; come to Lagos, they are more than 50 in my cell. Not only in Lagos but across the country, it is hard to differentiate some Police officials from street urchins in the shabbily ways they dress. Along the Enugu/Port Harcourt expressways, it is observable that Police officials have a field day in carrying arms without wearing Police uniforms or, wear slippers or sandals while on police uniform. Investigations have shown that the Nigerian Police Force is not underfunded to warrant the disgrace that some of the officers bring to the organization in the name of dressing while on duty. The budget provisions were made for the Force to enjoy strategically empowerment. The Senate committee on Police Affairs knows about this development. However, it is questionable whether the ugly behaviours by some of the Police officials were associated to a media report which stated: “The budgetary allocation to the Nigeria Police Force in the 2014 Federal Budget may not be adequate to meet its onerous statutory functions… It was not the Police itself but the Senate committee on Police Affairs that raised the alarm when the Supervising Minister, Olajumoke Akinjide defended the budget of the Ministry of Police Affairs and the agencies under it at the National Assembly. “The chairman of the Committee, Igwe Paulinus Nwagwu had observed that the funds allocated to the Police for personnel costs in 2014 were slashed to N279bn as against N292bn allocated in 2013, while the allocation for overhead cost had declined from N7.6bn to N5..4 bn without justification. Odimegwu Onwumere, Poet/Writer, writes from Rivers State. ([email protected]). Tel: +2348057778358. Disclaimer: "The views/contents expressed in this article are the sole responsibility of Odimegwu Onwumere and do not necessarily reflect those of The Nigerian Voice. The Nigerian Voice will not be responsible or liable for any inaccurate or incorrect statements contained in this article."